Vehicle Crossovers are access driveways to residential or commercial properties from the road. Vehicle Crossovers are access driveways to properties from the road. 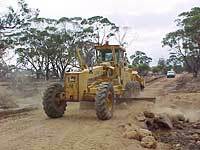 To construct a crossover, contact the Shire Office on (08) 9887 1066 to obtain an application form. Complete this form with as much information as possible including a day-time telephone number and return to the office. Once received, a staff member will contact you to arrange an inspection of the site. Council will provide one standard crossover to each property free of charge. All subsequent crossovers will be regarded as private works. Alternatively, you may arrange for someone else to build a crossover for you however you must still seek Shire of Pingelly approval for the design. For further information on crossovers and their construction, please contact the Works Supervisor.